Shrinking sleeves using Leister air heaters are more convenient, more efficient and less expensive than those from other brands, according to the UAE-based BMC Gulf. During the last years the Gulf region and in particular cities like Dubai have evolved to become major manufacturing, production and logistics hubs for a growing food and beverage processing industry, according to Fabian Beermann, division manager at BMC Gulf, Leister’s sales and service partner in the UAE. Some of the reasons lie in an increasing domestic and touristic demand yet also in the growth of the Islamic economy and the demand for halal food and local production. While in the past steam tunnels were the first - and often only - choice for shrinking processes, today’s producers of beverage and dairy products would rather use the more cost-effective hot-air technology. (Top) Bottles on their way to the shrinking tunnel, sleeves are loose, (centre) Watch the upper part of the sleeve on the bottle in the tunnel, still loose, (bottom) and snap, the sleeve is tightly shrinked. This is Leister Hot Air! For shrinking sleeves there are basically two distinctly different techniques for developing the required heat: using steam versus using hot-air. The use of steam tunnels for shrinking processes was long time favoured since many industries were already using steam for other processes while hot-air technology was barely known among producers of sleeve labelling machines. Many producers of beverages had been forced to optimise their processes during times of economic crisis. As these companies were usually not equipped with steam tunnels they opted for the more cost-effective hot-air technology while a significant number of producers decided to outsource the shrinking process to their bottle manufacturers. Depending on the application, shrinking with hot-air can be way more efficient than using steam tunnels. 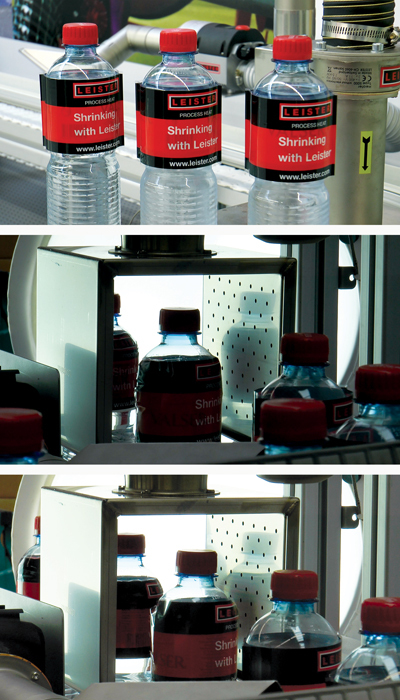 Hot air can be applied precisely to any specific spot where heat is required; shrinking temperatures can be regulated according to requirements when it comes to different bottle sizes. A great advantage is the fact that the bottle is perfectly dry inside by the end of the shrinking process. This way they can be delivered directly to the beverage producer without any additional drying process. Another major advantage lies in hygienic aspects since using steam for shrinking will always leave condensate residue. After bottles have been filled these residues may lead to mould growth around the lid when stored. By contrast, shrinking with hot-air will dry the bottles completely, so that they can be passed on for bottling without additional drying needed. The shrinking results and the production rates when using hot-air are exceeding what customers once knew. There is no doubt that hot-air technology with Leister’s Swiss-made quality heaters and blowers will contribute to the high level of quality required by the food and beverage industries in the Gulf region. Leister’s hot-air technology for shrinking sleeves on a typical production line in action can be seen on https://www.youtube.com/playlist?list=PLC15088664C51A12B). Dubai-based BMC Gulf is one of the UAE’s leading suppliers for pipes, fittings and valves made of HDPE (high density polyethylene), PP (polypropylene), PVDF (polyvinylidene difluoride) and ECTFE (ethylene chlorotrifluoroethylene) as well as welding machines and equipment for the processing of semi-finished thermoplastics materials. Based in Switzerland, Leister has been the world leader in plastic processing offering hot air, hot-wedge and handheld extrusion welders for more than 60 years. The company develops and produces all products and accessories in Switzerland so that customers can rely on the veritable Leister quality, and it is certified under the strict requirements of ISO 9001 standards. Leister maintains and updates a dense network of more than 120 sales and service points around the globe.